← Join us to Honor and Celebrate! From a South Valley farm to a southern NM trail race, our 2015 award winners have taken environmental education and run with it! The Dr. Richard W. Becker Award honors New Mexico’s outstanding educators who are influencing students through environmental education and service learning. For 2015, we recognize two amazing individuals: Joe Garcia, Farm Education Director at La Plazita Institute, and Stephanie Haan-Amato, Science Education Specialist at the Asombro Institute for Science Education in Las Cruces. 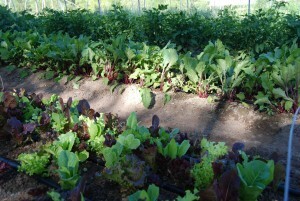 A garden bed at Sanchez Farm. Photo courtesy of Bernalillo County. Joe Garcia is the Farm Education Director at La Plazita Institute in Albuquerque’s South Valley. He has worked with the County Parks and Recreation office in California, La Plazita Institute as the Garden Manager and Educator, at UNM teaching classes, and working on numerous boards and committees. During his time as Farm Education Director for La Plazita at Sanchez Farm Open Space, Joe worked with groups from Peanut Butter and Jelly preschoolers to college students to professionals at the Farm. He has engaged numerous groups in service learning projects that include habitat restoration and garden-related activities, emphasizing the importance of service learning projects in the context of our larger environment and local community. He inspires people to deeply reflect on the incredible planet we live on, and see the magic all around us. Currently, he is working with college students as he facilitates the Garden Wisdom Program for transformative learning. Joe has continued his own graduate education, now pursuing a Doctorate in Transformative Learning and Holistic Education. He keeps up-to-date on environmental literacy and philosophies of education that result in civic action and personal growth. Joe has partnered with EEANM through several projects, bringing a depth of experience and perspective. 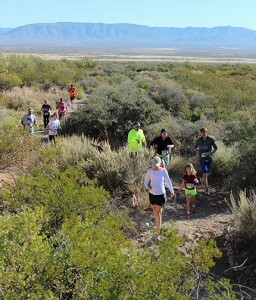 Runners enjoying the Chihuahuan Desert during the Desert Dash. Photo courtesy of Asombro Institute. Stephanie Haan-Amato is the Science Education Specialist at the Asombro Institute for Science Education in Las Cruces. She previously worked as a biologist and a high school biology teacher. Stephanie’s focus has been on three programs that highlight her talent for engaging participants in environmental education through stewardship and collaboration: (1) Earth Squad citizen action program, (2) Climate Hub curriculum development, and (3) Desert Dash Trail Races. Stephanie created the Earth Squad citizen action program in spring 2013 to give youth a sense of power and personal investment when they implement solutions to environmental issues. Students worked with Stephanie over 11 weeks, learning about greenhouse gases and how to find reliable, online scientific resources about climate change. Equipped with this new knowledge of climate change science, students brainstormed potential actions to reduce greenhouse gas emissions and then formed 3 committees to implement their plans: (a) a school recycling plan involving students, staff, and parents, (b) a campaign and contest to reduce energy used at school by turning off unused lights and appliances, (c) a “no- idling zone” in the parent pick-up area to reduce carbon emissions from idling cars. USDA’s Southwest Regional Climate Hub delivers climate-smart information and technologies for agriculture and land management. Stephanie is developing five, inquiry-based education modules for middle and high school students who will become the next farmers, ranchers, land managers, and informed citizens. Stephanie developed the first module on the impact of global climate change on the water cycle in the southwest U.S. The unit includes nine hands-on activities to help students understand causes and consequences of predicted climate change on the Southwest’s water cycle through innovative experiments, games, critical readings, and data interpretation and presentation. The Desert Dash Trail Races are now an annual event at the Chihuahuan Desert Nature Park. The event brings people out to enjoy getting active and supporting Asombro’s programming.